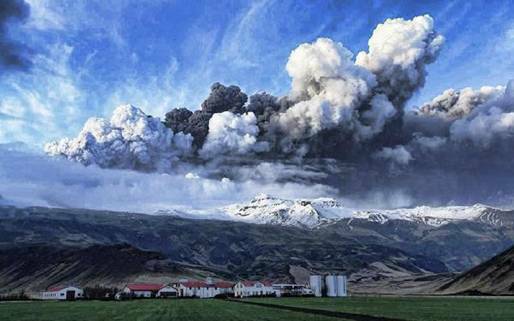 Catastrophic Eruption of Iceland’s Eyjafjallajokull Glacier Volcano sending Threatening Clouds of Pumice Ash towards Europe, heralding a Total Halt to Economic Air Traffic around the World for weeks, months, or years. Iraqi Drought Called Worst Since "Earliest Days of Civilization"
Destination Yisra’el – “It was early day on Wednesday, April 14, 2010 that smoke and steam began belching from the 200 year old volcano laying formant under the Eyjafjallajokull glacier in Iceland for the second time in less than one month. Melting ice, shooting smoke and steam erupted into the air for thousands of feet forcing hundreds of Icelanders to flee the rising floodwaters. 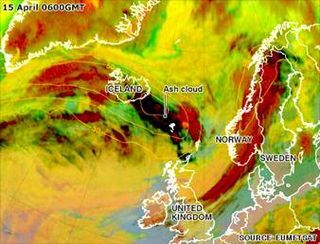 Over 4000 flights were suspended from Northern Europe as the entire European airspace in the north was completely shut down to all air traffic in Norway, Sweden, Finland and Denmark all the way down the European coastline from Britain to Spain. In what was described as the worse airspace restriction in living memory, on the first day alone, it affected the flying plans of over 600,000 people in Great Britain. Europe was “walking in uncharted waters” for never have they had to experience this same scenario in recent memory only reminiscent of explosion of Mount St. Helens but never to this extent and affected such a large part of the world’s traveling populations. As the cold frigid air awakened America to a new year in 2010, America was reawakening that a new reality was upon them. It would affect the very core of their lives, more so than banking scandals, government corruption, was the reality that nothing was secure in their lives; the currency in the wallets, the security of their homes, and the assurance that the vast breadbasket of the United States would be able to grow and produce enough food to provide sound nutrition for all Americans. We looked over the world horizon, and realized that nothing was secure any more. The borders of nations were evaporating. The principles of governance were disappearing. Even more alarming was the evidence that the earth itself was erupting as in revulsion with chaos as the weather was vacillating in extremes between drought and floods, scorching famines and frigid summers. Now an environmental winter was about to descend upon the nations of the Ancient Roman Empire, but more especially upon Northern Europe, where the Lost Tribes of the House of Israel have been making their temporary homes for almost 2200 years. Not only was world economic collapse looming on the horizon, but air traffic transportation to and from the economic hub of the world’s economic order was coming to a screeching halt. Yet the troubles were even more serious! Guardian UK – “A water shortage described as the most critical since the earliest days of Iraq's civilization is threatening to leave up to 2 million people in the south of the country without electricity and almost as many without drinking water. An already meager supply of electricity to Iraq's fourth-largest city of Nasiriyah has fallen by 50% during the last three weeks because of the rapidly falling levels of the Euphrates River, which has only two of four power-generating turbines left working. If, as predicted, the river falls by a further 20cm during the next fortnight, engineers say the remaining two turbines will also close down, forcing a total blackout in the city. Down river, where the Euphrates spills out into the Shatt al-Arab waterway at the north-eastern corner of the Persian Gulf, the lack of fresh water has raised salinity levels so high that two towns, of about 3,000 people, on the northern edge of Basra have this week evacuated. "We can no longer drink this water," said one local woman from the village of al-Fal. "Our animals are all dead and many people here are diseased." Iraqi officials have been attempting to grapple with the magnitude of the crisis for months, which, like much else in this fractured society has many causes, both man-made and natural. Two winters of significantly lower than normal rainfalls – half the annual average last year and one-third the year before – have followed six years of crippling instability, in which industry barely functioned and agriculture struggled to meet half of subsistence needs. Skiffs that once plied the lowland waters lie dry and splintering and ducks wallow in fetid green ponds that pocket the maze of feeder streams. "For thousands of years Iraq's agricultural lands were rich with planted wheat, rice and barley," said Salah Aziz, director of planning in Iraq's agricultural ministry, adding that land was "100% in use. This year less than 50% of the land is in use and most of the yields are marginal. This year we cannot begin to cover even 40% of Iraq's fruit and vegetable demand." The land that was once called the “Cradle of Civilization” and the “Breadbasket of the World” was declining into desolation and catastrophic destruction. Here yet, was a harbinger of the world at large – decline, desolation, and destruction. As we consider the options, we are speechless. Are we responsible? If so, can we reverse the course? Are these global events and weather changes caused by the very Providence of G-d meting out judgment upon our world? Have the agencies of the natural world that were clearly perceived as the immutable laws of nature now being hijacked by the forces of darkness? Are we soon to meet the apocalypse of Divine Justice as our world goes into catastrophic upheavals when our twin binary dwarf Dark Star returns to mete judgment and justice for all mankind upon this Planet Earth? In spite of the disasters that surround us are we willing to recognize that the Divine Hand that has been there all along protecting and preserving our planet yet now reluctantly withdrawing Himself from the very evils that we have allowed to be perpetuated upon our land or upon other people because of our greed, and lust for power and control? Our minds are in a whirl, when we consider that we might allow be allowed to share not vicariously but in total reality the destruction upon our own homes that the Haitian and Chilean people now have to live when their nations was entirely destroyed down to the infrastructure under their cities. Will we have to live through a life of complete destruction and annihilation before we are willing to give up the right to ourselves and recognize that we are dependent upon the Almighty One of Israel? Do we praise the Almighty for every breath we breath, for every photon of light that crosses our retina, for every decibel of sound that vibrates on the tympanic membranes within our ear canal, every nuance of taste ranging from sweetness to tangy-tartness that crosses our taste buds and every essence of fragrances that stimulate the olfactory nerves within our ears? Are we willing to give up the right to the life we live and to turn every ounce of energy to the restoration of all mankind so that the love from the Divine will once again spread over every land? If we can, will the G-d of Creation honor us for being a righteous one that is “safe to save”. Never before have the issues been so profound and the implications upon our lives so momentous that any wrong move may be the difference between life and death for our families. Let us look first at the evidence that is surrounding us. In a position paper for Global Research, titled “Catastrophic Fall in 2009 Global Food Production” and reported also as “Drought and Famine upon the World” on Unleavened Bread Ministries, Eric deCarbonnel reverted our minds back to the historical four year data (2006-2009) that was posted by the USD value of agricultural output starting in 2006 map with countries highlighted in green, 2009 map and in the second pictorial map on the countries depicted in shades of red to depict those countries that were experiencing drought, extreme drought and historic drought. Here we received our first warning about how much worse it is today concerning the humanitarian crisis that is enveloping this planet. The Way It Is in (2009)! The picture is becoming one of universal truth. No matter what the globalists, the politicians, or the global warming theorists said, the drought conditions were becoming shared in almost every region of the earth, This was depicted in a video of the drought in China, Australia, Africa, South America, or the US, and the picture was all the same; visions of despair, misery , devastated crops, dying cattle and livestock and the destruction of vast forests for the lack of rain is becoming universal. As we scan the world, this is what we saw. Eric deCarbonnel – “If you read any economic, financial, or political analysis for 2010 that doesn’t mention the food shortage looming next year, throw it in the trash, as it is worthless. There is overwhelming, undeniable evidence that the world will run out of food next year (2010). When this happens, the resulting triple digit food inflation will lead panicking central banks around the world to dump their foreign reserves to appreciate their currencies and lower the cost of food imports, causing the collapse of the dollar, the treasury market, derivative markets, and the global financial system. The US will experience economic disintegration. The Way It Was in (2006)! Over the last two years, the world has faced a series of unprecedented financial crises: the collapse of the housing market, the freezing of the credit markets, the failure of Wall Street brokerage firms (Bear Stearns/Lehman Brothers), the failure of Freddie Mac and Fannie Mae, the failure of AIG, Iceland’s economic collapse, the bankruptcy of the major auto manufacturers (General Motors, Ford, and Chrysler), etc… In the face of all these challenges, the demise of the dollar, derivative markets, and the modern international system of credit has been repeatedly forecasted and feared. However, all these doomsday scenarios have so far been proved false, and, despite tremendous chaos and losses, the global financial system has held together. The 2010 Food Crisis is different. It is THE CRISIS. The one that makes all doomsday scenarios come true. The government bailouts and central bank interventions, which have held the financial world together during the last two years, will be powerless to prevent the 2010 Food Crisis from bringing the global financial system to its knees. So far the crisis has been driven by the slow and steady increase in defaults on mortgages and other loans. This is about to change. What will drive the financial crisis in 2010 will be panic about food supplies and the dollar’s plunging value. Things will start moving fast. Overconsumption is leading to disaster - It is absolutely key to understand that the production of agricultural goods is a fixed, once a year cycle (or twice a year in the case of double crops). The wheat, corn, soybeans and other food staples are harvested in the fall/spring and then that is it for production. It doesn’t matter how high prices go or how desperate people get, no new supply can be brought online until the next harvest at the earliest. The supply must last until the next harvest, which is why it is critical that food is correctly priced to avoid overconsumption, otherwise food shortages occur. The USDA—by manufacturing the data needed to keep supply and demand in balance—has ensured that agricultural commodities are incorrectly priced, which has lead to overconsumption and has guaranteed disaster next year when supplies run out. When we began to research the full extent of the crisis around the world, what a shock we found. Country after country were registering record decline in the agricultural output of their nation including the worse economic and agricultural conditions in decades and even in modern recorded history. With this investigation we first started in America – “The Land of the Free and the Home of the Brave”; the Promised Land where millions around the world found new live, freedom, and land to express their dream to its fullest extent. 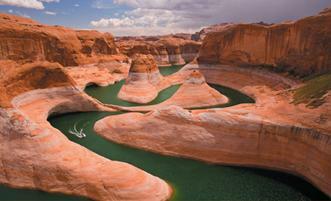 Lake Powell, California as it looked when the 175 miles, 2000 miles shoreline opened in the mid-1960s and 2005. 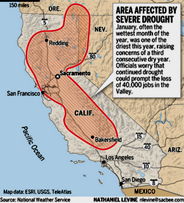 The largest state in America, California was facing its worst drought in recorded history, worse than in 1977 and 1991 where tens of thousands of acres of land were laying fallow. The water flowing down from the Sierra Nevada’s snowpack were only 48% of normal. 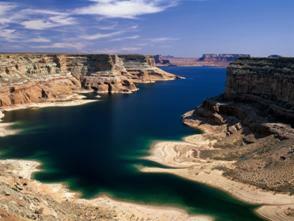 Lake Powell, one of the magical lakes in California opened up in 1963 to serve as a water reservoir for Los Angeles and Southern California. In the first seven years the water elevation rose from an elevation of 3410 to 3588 (178 feet) in the year of 1970 to its peak elevation of 3688 feet elevation in the year of 1988 (275 feet in 25 years). 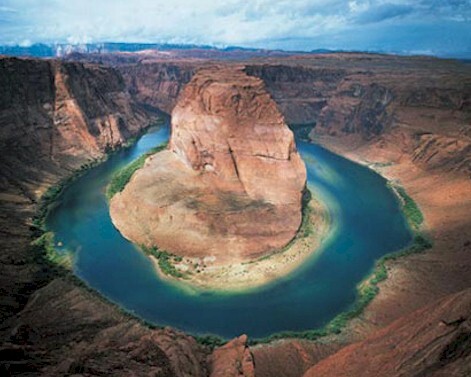 Then the level of Lake Powell became reflective of the state experience as its water level declined 110 feet in the twenty years between the years of 1983 to 2003. What even more astounding, the water level had dropped down to the levels thirty years prior, in less than a decade. The dreams of this vast water reservoir to being a water reserve for the burgeoning population growth in Southern California during that same period of time vanished. 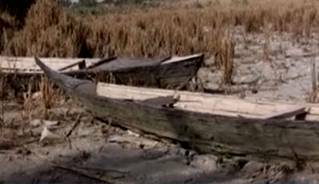 For three dry years in a row, the Sacramental-San Joaquin Delta remained in an “ecological crisis”. From this region came the “funnel for most of California’s precipitation”. 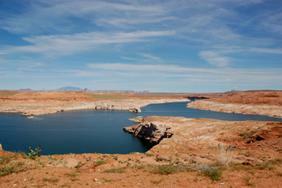 Since the last great drought in 1991, over 10 million Americans poured into the state. The farmers in the state converted hundreds of thousands of acres of land, formerly used for annual crops where land could be laying fallow during years of drought, into vast orchards of fruit, nuts, and grapes, which cannot lay dormant in years of low precipitation. According to computer models in UC Davis, Richard Howitt, professor of resource economics estimated that 40,000 jobs tied to the agricultural food chain of California would be lost along with $1.15 billion in lost income taken from the Central Valley south of the San Joaquin Delta alone. Water contracts in the future were estimated at only 15 percent of normal, making this drought in 2009 the most severe in modern history. In the month of January, 2009, the wettest month of the year, the prayers were for enough water to bring the state out of its two year drought, but instead, this was the driest January in historical record. Sacramental saw 1.5 inches of rain down from its historic average of 4.2 inches according to the National Weather Service. Redding, California garnered only 0.93 inches and massively down from its January average of 6.5 inches. The Texan drought is reaching historic proportion. 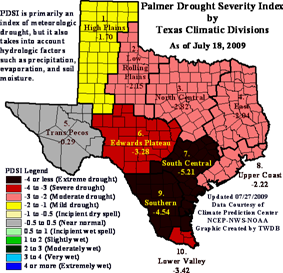 The drought conditions in the San Antonio and Austin region, and the Houston heat index in early summer, 2009 were recorded as the worse in Texas history, exceeding the historic drought of 1917-1918. In 2009, 90% of the State of Texas was experiencing drought conditions and 18-20 percent of the state in extreme to historic drought. In June, 2009, the temperature soared to searing heat above 100 degrees where the wet forest lands around Houston along the Gulf of Mexico were moving into severe drought conditions, the worse in 30 years. Even worse, the persistent 100 plus degree days along the southern part of the State of Texas were experiencing drought condition since the year of 2007. The Texas cattle industry was suffering as the cattle in some regions of the state were dying in parched pastures. The winter wheat crops sustained irreversible damage and with the onset of La Nina, the future looked grim. By August, 2009, Texas state climatologist John Nielsen-Gammon reported that at least nine of the 254 counties in Texas — the nation's most drought-stricken state — were suffering through their driest conditions since modern record-keeping began in 1895. The impact upon the farmers and ranchers in the nation's No. 2 agriculture-producing state were estimating their statewide crop and livestock losses from the drought at $3.6 billion. Large sectors of the state’s cotton fields, the conditions were so bad, that even though the cotton was planted, not one blade grew from the ground. In the corn belt of Texas, according to Bruce Wetzel, who started farming with his father in the 1960s, said that this was the worst year ever for corn. “The rains in April and May, up to 20 inches in two weeks, damaged the corn so bad that it never recovered”. In all, he lost 50% of both his wheat and corn crops during the 2009 harvest season; a trend farmers were experiencing all across Texoma. The peninsula State of Florida also was sustaining a severe winter drought, bringing crop damages as high as 50% in a state known for its agricultural fruit and vegetable industry. As the year progressed, what was noted most were the aberrant transcontinental wind streams suggesting that a La Niña cycle was not only in the making but was getting progressively worse. Cooler water temperatures in the eastern regions of the Pacific Ocean were beginning to create the onset of a 2009 La Nina where the trade winds that traditionally moved from the Pacific Northeast down towards Texas are were now traveling from the west to east across the breadth of the United States. Above this demarcation line, the rain storms traversed the country, below the lands descended into severe drought conditions. A progressive drought in the Augusta region of Southeastern United States depicted also the same conditions as this drought was now moving beyond two years. January 2009 was the driest in over twenty years. Were we beginning to see the reality of the Jewish Talmudic Sanhedrin prophecies? The drying up of the Australian Murray River because the population of Australia refused at first to accept the need for water rationing, also collaborated with Atlanta’s twin dilemma as the mighty Chattahooshee River was also drying up. Yet, instead of the authorities collaborating to find a solution for everyone with prudent rationing of the water usage from the river, instead, the power brokers jockeyed for power and control in the Atlanta federal court as the government was now competing against strong business and environmental interests for the control and use of water. It’s always easy to suggest that a nation that is experiencing a drought has lands that are becoming parched like a desert. It’s also so easy to suggest that when the rain begins to fall that all the problems and conditions sustained during the drought have been eliminated. What most people fail to comprehend, the weather has to be perfectly timed with rains to come right after the planting of the seed. Then there is a need for a dry period of time for the maturing of the harvest and to allow a quick harvest so that the commercially grown crops are not destroyed in soggy and wet fields. Such was the climactic end of the harvest year of 2009 as the harvests in many portions of the United States met with devastating results. According to Alabama Commissioner of Agriculture Ron Sparks, the rainy weather throughout the fall growing when the weather should have been dry during the summer maturing crop season in Alabama, Georgia and northern Florida may have been frustrating, but the farmers were still optimistic that they would be able to harvest substantial cotton, peanut, soybean and corn crops. The lint quality and cotton yields both were affected substantially by the wet and rainy weather conditions that affected negatively the Alabama crop harvests, as reported by William Birdsong, agronomist at the Wiregrass Research and Extension Center in southwest Alabama. With less than 5% of the crops harvested, the Alabama crop yield would go down as one of the worse crops years in history. The financial damage from Hurricane Ida, rains delaying harvests for three weeks made the crop loss up to 40-50 percent and some fields sustained 100 percent loss as the fall was quickly approaching winter weather. As winter approached, up to 40% of some crops were still not yet harvested. The financial losses from Hurricane Ida were already in the millions with both cotton and peanut harvest vulnerable for a early frost. The soybeans fields, once bountiful with harvest revealed only crops that were rotting and sprouting in the soggy fields. Don Fry - "Because it seems like it rains every second or third day, the ground is constantly kept wet. We've heard a lot of reports from people with wet spots turning up in fields that they and their parents ... don't ever remember being a wet spot." According to the Nebraska Emergency Management Agency, the Panhandle Region of Nebraska received so much rain that according to damage reports in the state, 1,000 miles of roadway were washed out. The reports across the state stated that there was widespread hail clear over to the far western Panhandle of the state. One rancher sent out a report that it hailed so hard that the roads were covered with 6 to 8 inches deep of hail on them and they had to be plowed up. The National Weather Service reported that dead animals were reported all along the road. The Federal Farm Service Agency reported that some 750,000 acres of crops were damaged and a small percentage destroyed. Up in Iowa, on July 24, 2009, the worst hail storm damage ever seen was documented by the Iowa State University field agronomist Brian Lang in his mid-summer (August) report. University field agronomist Brian Lang – “I've never really seen it this bad of hailed corn that came at the tassel state. I've never seen it this bad, this widespread. There were 400,000 acres damaged with 10 percent totally destroyed. Even for the crop that didn't get hurt too much, this came at the worst possible time, tasseling." As Julie Vulk, Farm Service Agency executive director in Winneshiek County wrote, “I've never seen a hail storm this big. It's just hard to wrap your brain around it." Even more perplexing, less than 50% of the farmers had any insurance. He even had to sell part of his herd of cattle to buy food for the rest of the herd because the grasshoppers ate all of the cow’s food. If the summer and fall damage was not enough, winter came early for most of mid-America in 2009. 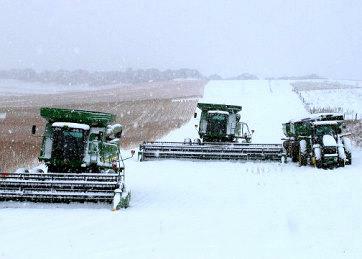 Early October in Nebraska and Minnesota, the soybeans were still in the fields and the harvest was surprisingly devastated as a sudden a snowstorm that dumped snow in Nebraska and surrounding states. It was expected, according to Victor Bohuslavsky of the Nebraska Soybean Board, that adverse weather conditions would diminish by expected 3.25 billion bushel crop of soybeans by 200 to 200 million bushels. Above in the State of North Dakota, the spring and summer that was unusually wet was followed by the fall which was prematurely snowy and wet. By October 5, 2009, two snowstorms had already coated a majority of the state white. What complicated this aberrant weather the most was the fact that early snowfalls would also melt leaving the ground soggy so that many of the farmers could not harvest their row crops before the official changing of the season from a normally dry fall to a snowy winter. During the autumn months, it is common to be able to watch the Dakota’s corn and sunflower crops be covered with snow. It is most unusual to witness the snow to set in over the soybean harvests. Yet in the year of 2009, the Dakota combines used to harvest the crops had to halt all their harvesting. They were left in the midst of the fields stalled because of the snow, resulting in significant delays in the fall late season crop harvests. Reports across the entire region reported snowfall from seven inches of snow reported in Iowa while in the nearby region of Northern Kansas, there was reported 10 inches of snow. Yet, the crops still in the ground were destroyed. In the region of Upper State of New York all the way to the State of Maine, the 2009 year was a very bad year. The milk prices had plummeted due to the world and national economic crisis. At the same time the price of hay skyrocketed as rain had prevented the farmers from getting into their fields to harvest the hay, while the same rainfalls were washing the fertilizer away. Julie Marie Bickford – “The season is lost. With milk prices so low and this feed disaster on top of it, the farmers are like deer in the headlights." As if predicting their impending destruction, the dairy farmers were being threatened of being run over by the grim economic conditions, so also were the corn, alfalfa, and hay farmers. The economic and weather conditions could not have collaborated in a worst way as poor quality hay and corn came to the market in diminishing quantities due to adverse weather conditions that stunted their growth and quality that in turn forced the dairy farmers to purchase more grain and feed whose prices were skyrocketing due to astronomical prices that were caused by the spring floods in Midwest America. According to dairy farmers in Maine, they could not come up with a more devastating situation to enhance their worst dreams. The conditions had become so critical, that earlier in the year in West Winfield, New York, a group of political representatives along with their aides presided over a panel at a rally for over 200 upstate New York dairy farmers at the Mount Markham Middle School gym. They were pleading for state assistance from the catastrophic conditions that were crippling the dairy industry. Over and over they took to the microphone to berate the county, state and federal representatives throughout the region as they painfully described the conditions in their areas with tears in their eyes, over their inability to make a living. A few of them screamed in frustration, others demanded answers not knowing that the local governments were also facing insolvency issues that were affecting the governments themselves. The dairy industry, one of the sectors of the economy that has routinely has been subsidized by the government was now coming to a rude awakening; their national and state governments were going bankrupt. The federal and state spigots were now dry. The United States and the New York governments were unofficially bankrupt. The vision of food lines like in the Great Depression were now becoming the vision of the future. The reality was that 2009 was the harbinger year for the farmer and by the year of 2010, many of them will already have abandoned their farms or farming businesses, or are to insolvent and so non-liquid that they cannot rescue themselves nor gather any of their own assets and move to something different. Nearby, Grasso, a third generation farmer, whose family has weathered economic and environmental conditions for over a century, including the Great Depression estimated his losses as about $50,000, with these remarks: “Nobody has ever seen rain as drastic as this year, even talking to old-time farmers." Next door in Virginia, the country-side of the farmers George Washington and Thomas Jefferson, as late as November 17, 2009, the torrential rainfall had not only delayed the harvesting of crops but the extent of damage to the crops was still unknown. The winter wheat, barley, and soybeans that had been recently planted and still growing in the fields were significantly damaged. One month later, these same regions were revisited to see if the catastrophic and grim reports were still as accurate as projected. Richard Petcher – “It's been a 30 percent loss so far in southwest Alabama, and more rain could make it 40 to 50 percent. Some fields are already a 100 percent loss." 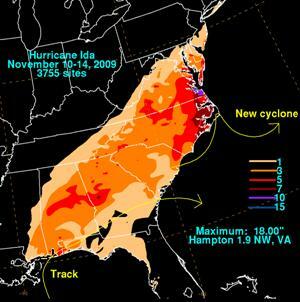 If the general aberrant weather conditions could not be worst, in 2009, Hurricane Ida became the strongest Cyclone of the 2009 Hurricane season. Yet the United States is not suppose to be getting cyclones that originate below the equator. 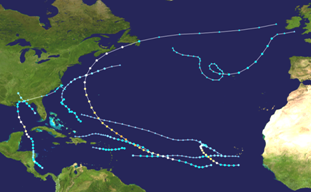 In a unique and freak weather event of nature, a phenomenon that was becoming more true than not, Cyclone (not Hurricane) Ida originated in Nicaragua in Meso or Central America and headed north across the Yucatan and into the Mississippi Delta region. Hurricane Ida (2009) like Hurricane Ike (2008) were both noted to be cyclones in that they developed in the Southern Atlantic region and not the Northern Atlantic where hurricanes are known to develop. Cyclone Ida, first originated alongside Panama and the Southern Caribbean Sea region, crossed over the eastern tip of Nicaragua with a maximum of 9 inches of rain at Puerto Cabezas, a near-miss to the tip of the Yucatan Peninsula in Mexico as a Category 2 Cyclone with 105 mph winds as bands of rain dumped 12 inches in Cuba to the far east. In the Gulf, she dissipated to 65 mph maximum sustained winds after she reached the the Gulf of Mexico and landed on the American coastline on November 9, 2009 in southeastern Louisiana. Yet, a new Ida now morphed into a Northeasterly Storm, like Ike who traveled north all the way through central United States to the region of Chicago before dissipating, Cyclone Ida’s maximum gusts of wind when she first landed at 74 mph at the mouth of the Mississippi River. She quickly moved east across the Mississippi coastline into the Panhandle of Florida. · Delaware at the Delmarva Peninsula with 10 foot storm surge with $43 million in damages; New York with beach losses of $8.2 million in damages, and flooding in Maine with 6.3 inches of rain. These were not normal weather disasters accepted as “Acts of God” and even with the $1.12 billion, we must recognize that this did not include the crop damages to regions in Southeastern United States during the Cyclone Ida. They had sustained drought for upwards to three years and now with their first bumper crop in years, the high hopes of the farmers were devastated as they watched their crops destroyed while watching their nation collapsing into an economic abyss. They could not even sustain themselves on a family farm. Allen Evan III – “You're just kind of walking around like a zombie, saying, never could I have guessed that the best crop I've ever raised in my entire life - the one I never worried about - of all the crops to have taken away from us, how can this be the one?" Back at the Delta, the elevator receipts of 2009 have become the talismans of the end times to the farmers. The curse of G-d appeared to be upon this nation. This farmer could not even comprehend that these same crop disasters were occurring over the whole earth. The nation was agriculturally blessed by the G-d of Israel, for this land was inhabited by His chosen children of the Lost Tribes of the House of Israel. They had come over first predominately as colonists from the House of Ephraim, the son of Joseph, the son of Jacob the Patriarch, from the Isle of Britannia called Great Britain in the 17th century were now with head’s down and spirits sorrowful pondering their future. Yet losing the family farm appears to be the wave of 2010, if the economic trend continues. The economic conditions in American continue into a persistent decline. Many are beginning to believe that the “conspirator tales” that the sovereign United States may disappear forever, divided and merged with Canada and the Mexico as the North American Union. But what was happening to the rest of the world? 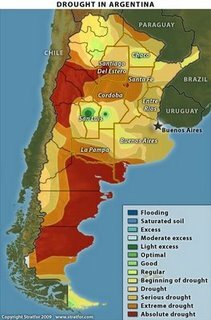 The worst drought in half a century that has turned Argentina's once-fertile soil to dust was pushing this country known for its agricultural industry into a state of emergency. Carcasses of cattle were scattered across farms and prairies while in the fields the sun-scorched soy plants withered under the intense heat of the South American summer sun. Argentina's food production was destined to decline a minimum of 50 percent, maybe more. The country's wheat yield for 2009 was estimate to be 8.7 million metric tons, yet this was down 47% from the 16.3 million yield in 2008. There was a concern also with the domestic shortages of food as the domestic wheat consumption alone was approximately 6.7 million metric tons. By the spring of 2009, Argentina has not granted any new export applications since mid January. Corn production in Argentina was also projected to drop from 20.9 milion metric tons (2008), to 16.5 million metric tons, on 26% fewer acres. Soybeans, on the other hand, saw a production drop 40,000 metric tons, down 15% from 47,000 metric tons a year earlier. In early 2009, the drought stricken regions of Brazil, we found the second largest exporter of soybeans in the world, and the third largest world’s production of corn, was now watching its corn harvesting wither from the desiccation of water from its farmlands. Brazil threatened to cut its outlook for the crops and will continue to do so. At the same time the Amazon forests was feared to be permanently destroyed by deforestation and drought. The most revealing was with increased land for planting by deforestation, Brazil's yield in corn harvesting was declining precipitously. What scarce news coming out of the country of Paraguay depicted a land that was struggling with a national crisis. The Paraguay government had already declared an “agricultural state of emergency”. At the same time, the food supply crops for the cattle industry had been destroyed and many soy plantations had lost their entire crops. Earlier in 2009, the country of Uruguay had already declared an "agriculture emergency" because secondary to the worst drought in several decades, the fresh produce and crops for human, and livestock consumption rose at the highest annual pace in four years. Secondary to the drought, the consumer prices on the food and beverage industry were also escalating to the highest level in four years. 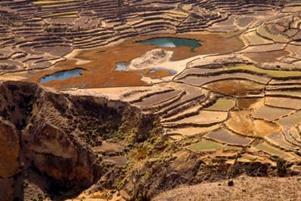 In the country of Bolivia, there was zero rainfall for almost one year. The agricultural and cattle industry were virtually destroyed as the cattle were perishing and the crops withered on the ground. Along the southernmost Pacific border of South America is the country of Chili where an “agricultural emergency” was declared in over 50 rural districts in the worst drought in five decades. Electricity rationing was also instituted in the early spring. As the cold waters of the forming La Nina along the long filament like country, the cool atmospheric conditions and high atmospheric pressures were preventing any precipitation in the central and southern parts of the country. This brought the water level of the reservoirs and hydroelectric dams to a record low. Africa was facing food shortages and famine. Food production across the Horn of Africa was suffering because of the lack of rainfall. Also, half the agricultural soil had lost the nutrients necessary to grow plants. The declining soil fertility across Africa is exacerbating drought related crop losses. On a continent whose images are associated with famine depict a stark reality of a land in which has so many natural resources, where the globalist nations of the world historically have been more interested in ravaging a continent for strategic minerals. Here was a 1994 “Pulitzer Prize” winning photo taken during the 1993 Sudan famine of a starving child crawling towards a United Nations food camp. 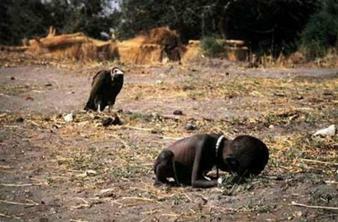 Nearby, a vulture waits patiently for the child to die so he too can eat. While the world was shocked by the stark reality of this picture, it does a symbolism of the vulture nations that have depleted this continent for their own “national interests”. The photographer, Kevin Carter, it was reported to have committed suicide from depression, finding it incomprehensive to understood what he saw and knew. Other African nations suffering from drought in 2009 were: Malawi, Zambia, Swaziland, Somalia, Zimbabwe, Mozambique, Tunisia, Angola, and Ethiopia. The Middle East and Central Asia were suffering from the worst droughts in recent history. Food grain production was dropping to some of the lowest levels in decades. Total wheat production in the wider drought-affected regions was estimated to have declined by at least 22 percent in 2009. Owing to the drought's severity and region-wide scope, irrigation supplies from reservoirs, rivers, and groundwater had been critically reduced. Major reservoirs in Turkey, Iran, Iraq, and Syria were all at low levels requiring restrictions on usage. Given the severity of crop losses in the region, a major shortage of planting seed for the 2010 crop was expected. The Fertile Crescent as the breadbasket of the Middle East was in a precipitous decline. In Iraq during the winter grain growing period in 2008-2009, there was essentially no measurable rainfall in many regions. Large swaths of rain-fed fields across northern Iraq simply went unplanted. These primarily rain-fed regions in northern Iraq were described as an agricultural disaster area in 2009. Wheat production had fallen 80-98 percent from normal levels. The USDA estimated that the total wheat production in Iraq in 2009 at 1.3 million tons was down 45 percent from last year. The Nation of Syria was experienced its worst drought in the past 18 years. The USDA estimated the total wheat production in Syria in 2009 would be at 2.0 million tons, down 50 percent from last year. In the summer of 2008, the water taps ran dry in many neighborhoods of Damascus. The Syrian residents of the capital city were forced to buy water on the black market. 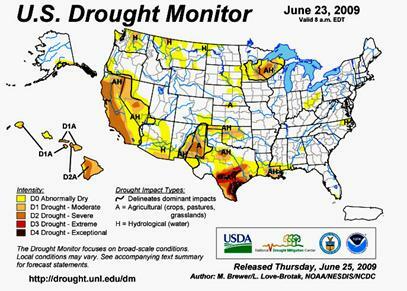 The severe lack of rain this past winter of 2008-2009 only exacerbated the problem. Lack of rainfall has led Afghanistan to the worst drought conditions in the past 10 years. The USDA estimates 2008/09 wheat production in Afghanistan at 1.5 million tons, down 2.3 million or a decrease of 60 percent from last year. Afghanistan normally produces 3.5-4.0 million tons of wheat annually. The persistent drought in the Nation of Jordan has progressively grown worse. Virtually no rain fell on the kingdom in 2008. The Jordanian government halted pumping water to agricultural regions to preserve the shrinking water supply to be used for drinking purposes. In the second largest rice producing country of the world next to China, India, by the summer of 2009, was importing food grains and edible oil purchases to increase its buffer stocks as a prolonged dry spell shrunk the yield of the summer crops. Of the 625 administered districts, 246 were drought hit when the summer monsoon rains were 26% lower than normal. The late summer monsoon season was expected to also be substantially decreased. By March, 2010 the Indian Express reported food inflation on the Indian continent was continuing to rise. In the first month of 2010, the inflation of rice shot up 17.97 percent for the week ending February 6 and was expected to continue to rise at least through March and April of the 2010 year. Yet, this inflationary rise of food was also threatening to break all records of rice inflation in known history when in 2009, it touched 20 percent inflation rate, the highest level touched in December, 2009. Yet, the price of rice was not isolated but a trend shared across the entire food marketplace. The fuel price index rose an annual 9.89 percent, the prices of cereals 12 percent, wheat 15.7 percent, vegetables 20 percent, and fruits 11 percent. Other Middle Eastern and Central Asian nations suffering from drought in 2009 were: The Palestinian Territories, Lebanon, Israel, Bangladesh, Myanmar, India, Tajikistan, Turkmenistan, Thailand, Nepal, Pakistan, Turkey, Kyrgyzstan, Uzbekistan, Cyprus, and Iran. The conclusion of Eric deCarbonel article titled, “The Great Drought Catastrophic Fall in 2009 Global Food Production” was sober in its fullest extent as he portends the future of global food resources. In his estimation, these reasons below were the primary reasons that the world economic leaders should not be worried about a global depression, but the worse case scenario; a global inflationary depression. On top of the world economic collapse, the drought in Northern China was reported to be the worse in 50 years where 4.37 million of China’s population and 2.1 million of their livestock were facing acute and severe water shortage. Many of the records in the northern and central sectors were recognized as the worse in recorded history. Since China is one of the largest wheat exporters in the world, the 2009 drought beginning in November 2008, threatened to destroy half of the entire wheat crop in the eight provinces of Hebei, Shanxi, Anhui, Jiangsu, Henan, Shandong, Shaanxi and Gansu. Reuters – “The drought began last autumn, and is the result not only of less rainfall but also unseasonably high temperatures, the official Xinhua news agency said…It is affecting the provinces and regions of Guangxi, Sichuan, Guizhou and Yunnan and the municipality of Chongqing. These parts of China are known for their sugar and rubber plantations. In the region that produces 60% of China’s sugar production could see a 4% decline in Guangxi’s sugar production, a fall of 300,000 tonnes from the 2008’s total of 7.63 million tonnes. In Yunnan Province, the drought is the worst seen in over 60 years and affecting over 85% of the province’s agricultural production. The entire continent of Australia was reeling under unrelenting historic droughts with the onset of two record-breaking droughts over the past seven years since 2002. 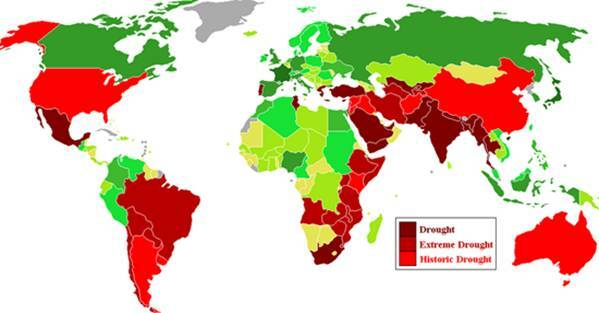 One of these droughts was considered to be “the worst drought in a thousand years” according to National Geographic. 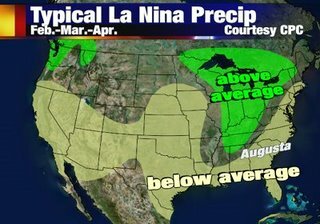 As opposed to the rest of the world, La Nina’s produce rain and El Nino’s produce drought. 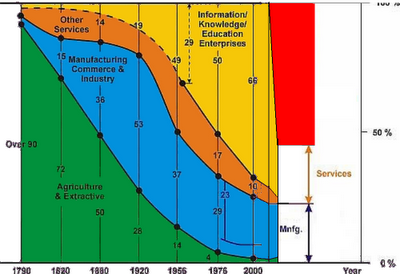 Here is a graphic showing what happened in the different sectors of the US economy over the last two hundred years. Officially this was the worse drought in the 117 years of record keeping and affected 41 percent of the nation’s agricultural regions. Rivers like the Murray Darling River Basin, home of 40% of Australia’s agricultural industry, no longer flowed to its terminal end. The evaporation on the lakes was so acute, that many of these fresh water bodies were now below sea level. When these lakes dried up they would release sulfuric acid and many heavy metals. This effectively created toxic swamps that scientists stated would never recover. Solution: create a Dead Sea like Israel and let salt water flow in and pray in the future for rain. The rice production, only 1% of the world’s rice production, was now only 2% of the pre-drought harvesting records. On the other hand, Australian wheat production comprises about 15% of the grain’s world trade of which 67% is exported around the world yet annual yields have dropped significantly over the past five to seven years. Here is what needs to happen in the next two years to bring the US economy back into balance. Eric deCarbonnel his trilogy expose when he wrote on March 8, 2010 the article titled, “It will be Far Worse than the Great Depression” when he made this analogy. Eric deCarbonnel – “If the economy was a person, then the producing sector (agriculture, manufacturing, mining, etc) would be its “income”. If the service sector was much smaller than the producing sector in the economy, such as China is today or the US was one hundred years ago, then that country would be living below its means or recognized as a net saver. 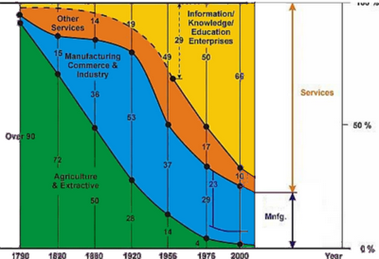 If the service sector is much larger than the producing sector of its economy, such as China is today or the US was one hundred years ago), then a country will be living above its means (depleting savings and going into debt). Here is what needs to happen (and what will happen) in the next two years to bring the US economy back into balance. The GDP is a flawed measure of a nation's wealth. If the economy was a person, then its GDP represents its “spending”. As anyone knows, by dipping into savings and borrowing money, a person can temporarily live beyond their means. This is what the US has been doing big time for the last few decades. It is ridiculous that economists consider the US to be the “largest” economy in the world based on this flawed economic measure. 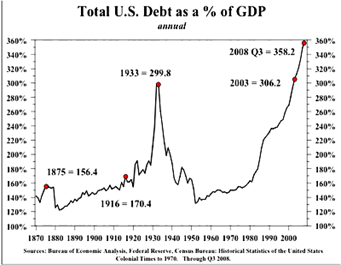 The reality is that total US debt should be compared to America’s producing sector (“income”). As a percentage of GDP, the producing sector in 1930 was four times the size of the producing sector today. This tells us that the US economic collapse will be far worse than the Great Depression. What is now becoming perceived as a global Ponzi Scheme, all we have to do is to remember a few months ago with the Jewish investment entrepreneur Bernard Madoff won the confidence of thousands of investors around the world to invest their millions of extra dollars, yet when the withdrawal requests began to come in, due to the economic downturn and the need to divest of money to save your own livelihood and possessions, Madoff did face his reality and actually told the truth. His friends and investors that thought that they were owners of billions of dollars were soon to discover to their dismay that they had a little over 100 million to divide among all of themselves. This same fact will come soon within the next few months, when the United States will have to face reality and admit, the American storage bins are missing ten to twenty million metric tons of soybeans. They do not exist. When we look over the global economic scene, several realities begin to come into sharper focus. Every year the USDA continues to publish the facts that America will be producing the largest food crops ever! Yet is there any support to that reality? What greater reality we do understand is the fact that we are not in a world of just droughts and famines but we are living in a world of extreme weather conditions that are setting us up for worldwide famine. The evidence is clear that droughts and extreme droughts ruined the crops of most of the major food producers in the world in the year 2008. The next piece of evidence is that in regions where there was drought a year ago had an abundant of rain in 2009. Yet the problem still exists, the crops yield continued to plummet. Why? Rain has to be timed to a perfect cycle or the growing season or any food stock will be destroyed by any aberrancy of this cycle, too dry when you plant or the seed germinates, too cold or hot when the plant comes to pollinate, too wet during the growing season with cloud cover and no sun that will stunt the growth of the plants, and too wet so harvests are delayed and the grain that is being produced become damaged, mildewed, rots on the shaft and therefore not usable for a sustainable food stock. Last, even with the most perfect weather and the best of growing seasons, if the snow or aberrant cold weather comes to early, ice storms and snow may destroy the entire season of a farmer’s hard labor and push him into bankruptcy. 1. The Land of Argentina was once a land of immensely fertile soil, yet the worst drought in 50 years has turned this land into a dust bowl, the nation into economic emergencies as their largest food commodity export wheat was declining almost 50% from 16.3 million metric tons of wheat produced in 2008 to 8.7 million metric tons of wheat in 2009. 2. The Nation of Australia, the former colony of Great Britain, hails as descendants of the Lost Tribe of Ephraim, the son of Joseph the Viser of ancient Egypt. Australia has though been experiencing the most severe and the longest drought every to occur on Planet Earth. Yet, in the year of 2009, the November temperature records were broken all over the eastern sectors of Australia. These resulted in lower wheat yields than expected. Australia has long been known to be a protector of their nation’s farmers as opposed by the United States that has supported the virtual destruction of the family farms for Mega-Agri farming. The Australian wheat production estimate was lowered in 2009 by 1 MMT to 20.9 MMT while the Commonwealth Bank of Australia cut their production estimates from by 0.7 MMT to 21.6 MMT. Yet, at the same time the USDA (United States Department of Agriculture) raised their estimates to an “inflated” 23.5 MMT in spite of continuous weather changes and disastrous crop losses. 3. 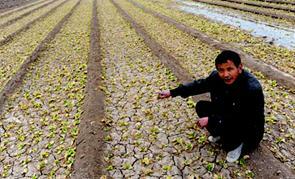 The Nation of China, as noted above, has been experiencing the worst droughts in its nation’s history in over 50 years. The “Best Case Scenario” suggests that their wheat production will be down 10%. In China’s northwest Ningzia Hui Region, there were massive food and water shortages for the 1.37 million people living there. 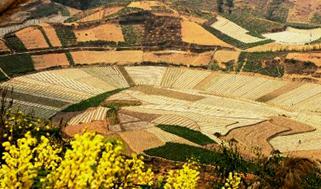 Corn production also in China was also expected to dwindle another 10% by the Spring Harvest season of 2010. 4. The Central Asia and the Middle East regions were also experiencing the worst drought in recent history. As noted in the first story of this article, Iraq, the “Bread Basket” of the ancient world, Iraq along the Tigris and the Euphrates Rivers has seen its entire agriculture collapse to almost non-existence. The total wheat production in the entire Middle East has declined almost 25% (1.4th) in the year of 2009. 5. On the continent of India, the Nation of India experienced its driest monsoon in 37 years. The aberrant weather changes of rain, hail, and wind virtually ruined India’s spring harvests. When taking a global look at the implications of the vast weather changes, the drought of India was the worse since 1918. Millions of famished Indians were left to flounder in the impending food shortages that were caused by the intense timing of the drought or the devastating floods that wiped out their land and homes. With no water left to grow food, the farmers most concerning fear was whether they had any water to drink. Yet, there were so many impoverished Indians that how many of them were “left behind” will never be known except by the Almighty One. The reality of the 2008-2009 credit crisis and the progressively erratic weather, and shortened growing seasons believed by many to be the result of the immense magnetic field of the suspected approaching Twin Binary Dark Star Solar System called Nibiru or Nemesis the Destroyer. These fluctuating hot spells, dry weather, rains and floods have been hampering the growing seasons for 2009-2010. Classically, the growing season for strawberries from California and Florida, the opposite sides of the American continent were separated by several weeks. Yet in the Spring of 2010, these growing seasons suddenly merged and the strawberries ripened at the same time in March-April 2010. The markets were flooded with cheap strawberries, but with the season shortened, the overall costs will be higher for the strawberries for they did not come into the marketplace at different weeks of the season. 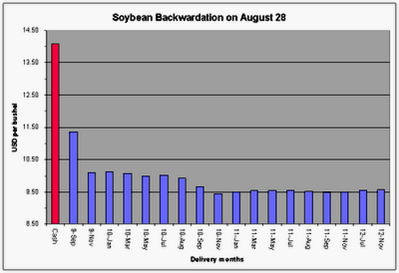 The U.S. soybean supply and demand, according to the statistics of Eric deCarbonnel depict the reality of the fantasy statistics that are being applied to the 2009 soybean season by the U.S. Department of Agriculture. According to deCarbonnel’s statistical reality study, the reserve stocks of soybean in America at the beginning of 2009 were calculated to be 3.76 million metric tons (MMT) in early 2009. The production of soybeans in America plus her imports, minus what was used in crushings for livestock feed, exports, seed, and residual stocks left an ending stock of soybeans in the United States at 6.95 million metric tons (MMT). Eric deCarbonnel – “By the end of August, grain movement in the US came to a virtual standstill, with farmers sold out of soybeans. Those few soybean end-users (ie: feedmakers and poultry producers) which caught short were forced to pay prices as high as they paid at the very height of the bull market in 2008. 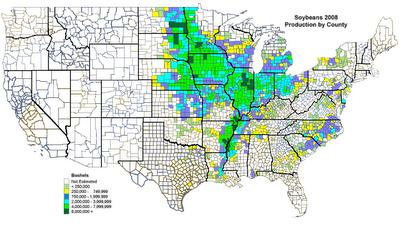 The chart (above) shows the backwardation of soybean futures on August 28 along with a map of the soybean production counties in the United States (below). The first thing is obvious is the remarkable difference in the price gap between the promises for the September and November contracts (the first two purple-blue graphs). Notice the even larger gap between cash prices (red graph) and the 1st purple graph on the chart above) and September futures. Then we look below at the metric tons grown in the past seven year growing season and the projected number of tons of soybeans sold in the growing season of 2008-2009. Where does that “demand” number of sales arrive except by a wishful cloud, speculation or true demand of a depleted world market of soybeans? Did such an event exist with the U.S. soybean production? Yes! As seen on the two maps here, we depict the total counties in America that are growing soybeans and coded from white (no soybeans) to increasing shades from yellow to dark green representing the bushel yield of soybeans in that county in the growing season of 2007/2008. Then we see the same map for 2008 reproduced in 2009. The ominous but revealing statistics are the counties in red that were declared disaster areas in 2009 due to flooding or drought. They depict how poorly the harvests were in each region. The obvious should be stated that disaster hit counties secondary to bad weather should give us a certain reality check that the government officials are presenting a optimistic wish list but not revealing the “rest of the story” for many of those “red counties” had severe crop losses over 30% of their total harvests. We must realize that the United States is the largest producer (32% or 87.7 MMT produced in 2006) and exporter of soybeans in the world. The next competitors are: Brazil (28% or 52.4 MMT), Argentina (21% or 40.4 MMT), China (7% or 15.5 MMT), India (4% or 8.3 MMT), Paraguay (3.8% or 8.0 MMT), Canada (3.5% or 7.8 MMT) and Bolivia ( % or 1.4 MMT) The grim reality is, when America runs out and has no more soybeans to export, a world panic will begin. Why? This small bean, the soybean is such a valuable part of the world economic culture. Ninety-eight percent of the U.S. soybean crop is used for livestock feed. It has become one of our main vegetable oils, plus dairy or meat analogues called TVP (Textured Vegetable Protein). Then we have soymilk, tofu, tofu skin or yuba, soy sauce, miso, natto, all-vegetable non-dairy whipped toppings, soybean flour, and wood flour. Soy is also found in many industrial applications, including phenol formaldehyde plastics, soy based plastics, and automobile paints. · 15 times more protein per acre that land set aside for meat production. As the crop analyzers weigh in on the pending crisis, they pour over the crop data details and this is what they see. The total soybean exports over the last eight years have averaged 3.6 times the peak in the outstanding export sales for that year. 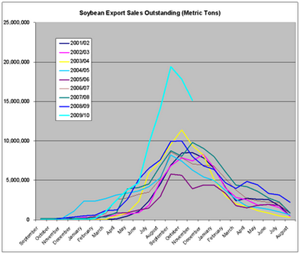 The chart here shows the outstanding soybean export sales and also shows what is wrong with the USDA’s export estimates for 2009/10. The reality hits hard for by September 2010 America may no longer have any soybeans to sell and the demand for soybeans export sales outstanding will skyrocket. Statistics show that the peak in the outstanding export sales between the years of 2001/2 to 2008/9 was between 5.8 MMT (million metric tons) to 10.0 MMT in 2008/9 year. 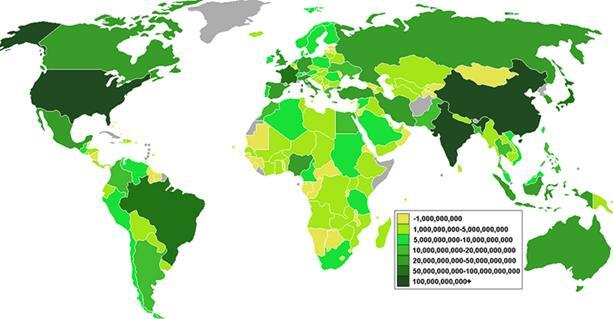 Yet the American estimate for soybean crop in the year of 2009/10 is 19.4 MMT, a whopping 90% increase. How is America going to grow that amount of soybeans in 2010, when such a fact that has never been accomplished in the past, how, in this era of erratic weather, expect America to almost double its soybean crop yield or production? If we take that 19 MMT and determine the “peak in outstanding export sales” for the year of 2010, it will give us, according to deCarbonnel, the “realistic estimate production for the year of 2009/2010 of 70 MMT (Million Metric Tons). These statistics are what Eric calls “catastrophically out of balance”. Now looking at the supply and demand of just soybeans, the USDA estimates that we have a beginning stock of 3.76 MMT of soybeans. According to deCarbonnel, we are in the negative so part of this year’s crop must be applied to sales from last year. The “bean bins” are empty. This time, the famine will not be like in the days of Joseph the son of the Patriarch Jacob, when he, with the wisdom given to him by the G-d of Israel stored for Egypt seven years of grain to carry that imperial society through a seven year drought. This time we have no Joseph. There is a lot of knowledge floating around but no wisdom on how to apply this knowledge. 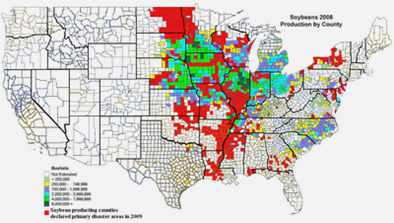 The production data for the 2009 soybean harvest was estimated to be 90.3 MMT but with the states of emergencies in most of the bean producing counties in America, the realistic estimate appears to be closer to 70 MMT. If the demand, as we calculated above for soybeans coming in from around the world as estimated by the USDA for soybean rises to 70 MMT of beans, and America’s imports, crushings, seed preserved, and residual remain the same as last year then, then the deficit stock of soybeans in the United States will be a total of 50.7 million metric tons (MMT) of soybeans for the year of 2010. If this occurs, economies will crash and inflation will skyrocket and the era of innocence will be over. As statisticians pour over the records of the American harvests along, not taking into account of the even huge disasters occurring in China, Argentina, Australia and elsewhere around the world, certain realities begin to loom larger and larger, when you go to the grocery store USA and realize that the price of America’s staple, a can of corn and a can of beans have risen 50% in the last five months. We begin to ponder the prophetic reality that we truly are prophetically sitting between the Third Black Seal of Revelation as we count the cost on the weight of barley as the hidden inflationary spiral begins to take effect. Then, if our eyes are open, we perceive the effect on our nation and globally as the Black Internationale asserts its control of the world economy. The effect upon our lives makes up feel like the frog sitting in a pan, not aware enough that the temperature of the water is gradually rising more and more, and before he can leap out of the pan, the water is boiling. Soon it will be revealed that the Black Pope is beginning to assert his control for truly all the intelligence organizations globally are now under his control. Then we begin to wonder as the “Black Prince” who sits in the Oval Office, his ancestry unknown, though reputed to be cousins to the Bushes and Cheney, we wonder is he likely to be a descendant of the Black Nobility of Europe. Yet, the mega-Christian churches of America are filled to the brim with platitudes of G-d’s goodness while failing to perceive that we are nearing the judgment and purifying season of the Almighty One of Israel as the Fourth Seal of Revelation raises its head upon the prophetic horizon. With the theme of these series of articles foremost in our minds, we begin to realize that the Sixth Seal of Revelation, with the Great Earthquake estimated to be as large as a 12 to 15 magnitude mega-quake that will “move all mountains and islands out of their place”. Will this epic event occur as early as 2012 when the suspected Twin Binary Dark Star called Nemesis the Destroyer will make a fly-by as it “Passes-over” planet earth and brings global destruction no less than what destroyed the largest empire of the world and precipitated the Exodus of the Children of Israel from Egypt to the Promise Land? Europe, the only big agricultural region relatively unaffected by drought, is set for a big drop in food production. Due to the combination of a late plantings, poorer soil conditions, reduced inputs, and light rainfall, Europe's agricultural output is likely to fall by 10 to 15 percent. These inventory numbers are dangerously low, especially considering the horrifying possibility that China's 60 million tons of grain reserves doesn't actually exists. The droughts plaguing the world's biggest agricultural regions should end the debate about deflation in 2009. The demand for agricultural commodities is relatively immune to developments in the business cycles (at least compared to that of energy or base metals), and, with a 20 to 40 percent decline in world production, already rising food prices are headed significantly higher. Is it now time to begin considering your prophetic destiny? The prophetic revelations of the potential future we are facing are almost half over. There is a lot of evidence yet to be revealed. For those of the Lost Tribes of the House of Israel, whose ancestors once lived in the lands of Northern Israel our prophetic destiny to be returned and restored to the land of our forefathers is yet to be fulfilled. 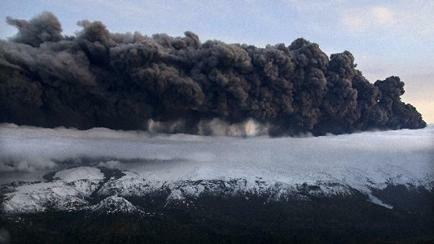 Now the finger of the L-rd has opened up a new dimension of drought and famine, this time totally under the control of the Eternal One of Israel, as Iceland’s Eyjafjallajokull Glacier Volcano continues to erupt gases and pumice ash into the horizon. The economic impact of the complete cessation of airline traffic for both international travel and cargo on Europe to and from the rest of the world is immeasurable at this time. It bodes ill for any economic stability at a time when now the SEC has charged Goldman Sachs one of the Federal Reserve Holding Banks with of Civil Fraud for failing to disclose a conflict of interest in mortgage securities. Significant instability will remain the rule on the horizon. Yet in the lands of the Spanish, Portuguese and Italian people who once held millions of occupied Jewish people during the Islamic Caliphate of Spain and the Roman occupation of the Jews after the destruction of Jerusalem in 70 CE also have yet to be repatriated back to the land of Judea. During these centuries, Jewish bloodlines have intermingled with the native populations giving a certain Jewish identity to millions more people on Planet Earth. As the descendants of the Patriarch Jacob in the delta district of Goshen, Egypt would not have left in mass to return to their Promised Land except under the catastrophic plagues that destroyed Egypt, so also most of the Jewish people who were exiled to the land of Babylon and Persia did not return to the land of Israel when the doors were open for them to return with the freedom and blessings of their imperial overlords. So it also appears that the G-d of Israel will have to bring great catastrophes and calamities upon this planet, before the only choice left will be to return to the G-d of Israel and the land in which He promised them that there He would bless them. What we are seeing today, progressive famine and drought is only the beginnings of tribulations that have yet to fall upon G-d’s chosen ones of Israel. Will it take the reality of a loaf of bread costing $25 when you have no job, or your home was destroyed in a Class 6 Mega-Hurricane with winds in excess of 250 mph, or the entire megalopolis with 30-60 story skyscrapers where you lived was inundated with a 1000 foot tsunami or when a mountain size asteroid impacted the ocean one hundred miles offshore and you and your family barely escaped for your life, before your eyes are opened to the greater reality of your destiny? All of these are prophetic realities may happen soon! It’s time for the Lost Tribes of the House of Israel to take inventory of their lives!